Below are dozens of links that show how, at the level of public awareness, the tide is slowly beginning to turn against the fearmongering, fraudulent vaccine industry and vaccine pushers. Many of these news stories provide damning evidence proving that vaccines are at best ineffective, at worst a complete hoax and even genocidal. Please inform yourself and distribute this information widely. DOCTORS RESORTING TO INTIMIDATION & MIND GAMES TO GET PARENTS TO VACCINATE THEIR CHILDREN. Have you noticed your doctor using this “presumptive language” technique on you at checkups? If so, it’s high time to find another doctor who doesn’t resort to mind games to manipulate patient behavior. VACCINE FRAUD EXPOSED: MEASLES & MUMPS COMING BACK BECAUSE VACCINES ARE DESIGNED TO FAIL, SAY MERCK VIROLOGISTS. Scientific fraud is an inherent part of the vaccine industry. How do we know? Because whistleblowers who worked in the industry have found the courage to speak out and tell the truth. These people are the Edward Snowdens of the vaccine industry. CONNECTING THE DOTS: GMOS & VACCINES. Humans suffer from hubris—we think we know better than nature, can fix it, manipulate it and master it. There are (at least) two major transgressions that follow similar patterns, raise important red flags and most certainly do not pass the sniff test: GMOs (genetically modified “foods”) and vaccination. Here’s what they have in common. SCIENTIST RAISES SERIOUS VACCINE QUESTIONS. Peter Doshi, a scientist at Johns Hopkins University, recently published a paper in the BMJ raising serious questions about the benefits of influenza vaccine. He criticized the methodologies of the major studies on which America’s public health push is based, as well as pointing to statistics which indicated there are more potential dangers to the vaccine than the CDC indicates, including mercury poisoning, increased incidence of narcolepsy and death. TOP 5 REASONS NOT TO VACCINATE YOUR CHILDREN. Here are five succinct reasons not to vaccinate your children. This is not an exhaustive list. If you are on the fence, you can use it as a starting point to dig deeper. If you already made the decision not to vaccinate, you can pass this along to friends and family who may have questions. VACCINE DANGERS: BOMBSHELL ADMISSIONS FROM CDC EPIDEMIOLOGIST. Finally! After years of denial and damage, the truth about ethylmercury in the form of Thimerosal in vaccines has been revealed to a member of the US Congress as a result of oversight requests sent to the CDC and shared with one of the foremost research groups regarding mercury in drugs, CoMeD. SCIENTISTS FINALLY ADMIT H1N1 VACCINE CAUSES INCREASED RISK OF GUILLAIN-BARRE SYNDROME. A new study published in JAMA admits that the vaccine widely administered for H1N1, also known as “swine flu,” is linked to neurological damage in the form of Guillain-Barre syndrome. The findings confirm several earlier studies in both the US and UK that also linked the H1N1 vaccine to severe neurological damage. WHERE VAX CHOICE IS WINNING & WHY IT IS A BASIC HUMAN RIGHT. An increasing number of educated parents are coming to the same conclusion and rejecting vaccines. Communities of these families can be found in Northern California, Colorado, Oregon and Washington. High exemption rates in those areas indicate that informed parents are not obeying CDC vaccine dictates. Vaccines are simply one concern of educated parents who are eating organic and avoiding chemical exposure. HISTORICAL DATA SHOW VACCINES DIDN’T SAVE US. Do vaccines actually protect against viruses and illnesses? If you only get your information from mainstream sources, the question as to whether vaccines are effective is never even raised. However, if you look at the historical data on vaccination efficacy, you’ll see that so-called immunizations are NOT responsible for the decline in diseases in the last hundred years. THE INSIDE SCOOP ON VACCINE DANGERS. In all likelihood, if you’re being treated by a conventionally-trained medical doctor, you have never been told the truth about vaccine ingredients or its threat to human health. In truth, vaccines have been linked to immune system damage, kidney failure, seizures and even death! “GREEN” VACCINES ARE STILL HAZARDOUS TO YOUR HEALTH. Here’s the Kobe University study’s conclusion: “Systemic autoimmunity appears to be the inevitable consequence of over-stimulating the host’s immune system by repeated immunization with antigen, to the levels that surpass system’s self-organize criticality.” Ironically, the initial purpose of this study was to understand how autoimmune diseases develop. It was not originally intended as an effort to prove vaccination danger. HOW BIG PHARMA HIDES VACCINE DANGERS FROM PARENTS. The vaccine industry has taken great pains to make sure that only favorable, predetermined studies conducted using compromised research criteria make it for public consumption—a massive industry sleight of hand that continues to shroud the truth about vaccines behind a thick veil of misinformation and disinformation. CHILDHOOD VACCINES CAN CAUSE DIABETES & METABOLIC SYNDROME, RESEARCH CONFIRMS. Comprehensive research compiled by expert immunologist Dr. J. “Bart” Classen has uncovered the disturbing fact that childhood vaccines are a common cause of both type 1 and type 2 diabetes, as well as a barrage of chronic illness symptoms typically associated with metabolic syndrome. 2013 MEASLES OUTBREAK: FAILING VACCINE, NOT FAILURE TO VACCINATE. Are the recently reported measles outbreaks in the US being caused by failure to vaccinate, or failure of the vaccine? Shockingly, clinically confirmed reports of measles vaccine failure in fully vaccinated populations stretch back at least a quarter of a century from around the world. BLOOD DONATIONS FROM PEOPLE MERELY VACCINATED AGAINST HPV MAY BE HARMFUL TO RECIPIENTS. A shocking new report reveals that receiving blood donated from someone vaccinated with Gardasil, the Human Papilloma Virus (HPV) vaccine, may be downright dangerous to your health. THE SHOCKING LACK OF EVIDENCE SUPPORTING FLU VACCINES. With the flu season ramping up, many are looking to vaccination as a “preventive” approach. Those who abstain are often accused of being uneducated or, worse, socially irresponsible. Nothing could be further from the truth. It is not sound medical science, but economic and political motivation which generates the immense pressure behind mass participation in the annual unscientific ritual of flu vaccination. VACCINE COMMITTEES WITHHELD CRITICAL DATA ON ADVERSE REACTIONS FROM PARENTS & HEALTH PRACTITIONERS. Official documents obtained from the UK Department of Health (DH) and the Joint Committee on Vaccination and Immunisation (JCVI) reveal that British health authorities have been engaging in such unethical practices for years, apparently for the sole purpose of protecting the national vaccination program. IS YOUR “HOLISTIC” VET REALLY HOLISTIC? Holistic veterinarian Will Falconer, DVM, who owns and operates the highly informative website Vital Animal, addresses this question in a recent blog posting entitled “Vaccines and Vets: Is Your Holistic Vet Really Holistic?” In this powerful commentary, Falconer describes his journey from being a “holistic” vet in name only to becoming a truly holistic vet who learned the errors of his ways regard pet vaccination and corrected them. SUPER CREEPY: VACCINE COMPANY USED NSA-LIKE SURVEILLANCE TO CIRCUMVENT PARENTAL CONCERNS ABOUT VACCINATION SAFETY. The NSA has been caught using its vast infrastructure to eavesdrop on virtually all Americans’ electronic communications. What you probably didn’t know is that GlaxoSmithKline has been caught using NSA-like Internet surveillance to circumvent concern by parents regarding vaccination safety. 10 OUTRAGEOUS BUT TRUE FACTS ABOUT VACCINES THE CDC & VACCINE INDUSTRY DON’T WANT YOU TO KNOW. Prepare to be shocked. Here are ten outrageous (but true) facts about vaccines the CDC and the vaccine industry have done everything in their power to hide from the public. DO VACCINES CAUSE AUTISM? YOU BETCHA! This systematic suppression of the truth about vaccine-damaged children is revealed in a must-see new video just released by the Canary Party and narrated by actor Rob Schneider, an outspoken advocate of parental rights when it comes to medicine. MERCK VACCINE DEVELOPER ADMITS VACCINES ROUTINELY CONTAIN HIDDEN CANCER VIRUSES DERIVED FROM DISEASED MONKEYS. There is a dark, deadly truth about the vaccine industry, the CDC and vaccine scientists everywhere. The truth is that vaccines are the vector by which cancer and other diseases are spread through the human population. The rise of many diseases—such as cancer—correlates very strongly with the rise of mandatory vaccinations around the world. GARDASIL DEVELOPER ADMITS VACCINE IS USELESS & DEADLY. Did you know that one of the lead researchers involved with developing the two available vaccines for human papillomavirus (HPV), Gardasil (Merck & Co.) and Cervarix (GlaxoSmithKline), admitted back in 2009 that the jabs are essentially useless and more dangerous than the very conditions they are hailed as preventing and treating? CDC ADMITS, THEN RETRACTS STATEMENT THAT MILLIONS OF AMERICANS WERE INJECTED WITH VACCINES CONTAINING CANCER VIRUS. Always question medical professionals who say that you or your child needs a certain vaccine or prescription. So much “medicine” today is actually poison. Professionals are often duped into believing in the safety of a vaccine or prescription, when all along it may be laced with cancer-causing, health-ravaging viruses, heavy metals, fungus, formaldehyde or neurotoxins. BILL GATES & WHO TEAM UP TO COUNTER NEGATIVE VACCINE STIGMA WITH … PUBLIC SURVEILLANCE SYSTEM! It’s encouraging for anti-vaccine advocates when international funding agencies start to invest in surveillance projects focused on monitoring public concerns around vaccines. It means they’re scared and they should be. The world is sharply dividing on the issue and it appears those on the fence are rapidly joining one side—and it’s not the side the vaccinators would have hoped for. JOHNS HOPKINS SCIENTIST BLASTS CDC FOR PUSHING FLU SHOT. Federal health authorities vastly overstate the benefits of the flu shot and, for most healthy people, vaccination is unnecessary at best and potentially risky at worst, says a Johns Hopkins scientist. VACCINES HAVE HAD NO HISTORICAL HEALTH BENEFIT OR IMPACT ON DISEASE PREVENTION. A new study of the role of vaccination in the natural course of infectious disease in Switzerland and Germany supports data from other regions that vaccines had no impact on disease prevention efforts from the early-mid to late 20th century. The data contradicts widespread misinformation campaigns by mainstream medicine which claim that vaccination led to immunization and a subsequent decline in infectious disease. HPV & HEPATITIS B VACCINES DON’T PREVENT CERVICAL CANCER & LIVER DISEASE. HPV and Hepatitis B vaccines have proven to be dangerous and even fatal. Hepatitis B vaccines, routinely given to infants at birth, are associated with sudden infant death syndrome (SIDS) and other debilitating injuries. In the case of the HPV vaccine, early evidence suggests they actually increase young women’s risk of cervical cancer. FLU VACCINE CAUSES RESPIRATORY INFECTIONS. The utter absurdity of vaccination “science” is revealed in this study. It claims a flu vaccine results in less disease risk because it causes antibodies to develop, in spite of not reducing the likelihood of contracting the disease and also resulting in 5.5 times more incidents of similar diseases! MAINSTREAM VACCINATION SUPPORT: ANOTHER BOGUS CHAPTER IN A BOGUS STORY. Despite a mounting and impressive body of evidence of the dangers and harm associated with vaccinations coming from both within and outside the mainstream medical community, much of mainstream medicine and the agencies that serve it continue to maintain that vaccinations are not only safe, but that we face grave dangers if we don’t vaccinate ourselves, our children and our elderly—and do so often. GUT FLORA CREATE IMMUNITY, NOT VACCINES. Adequate probiotic and balanced gut flora account for up to 80% of our immunity. It makes sense to maintain a good diet, take in probiotic foods, avoid antibiotics and vaccinations, and breastfeed children for at least a year. Vaccinations and antibiotics given to newborns and older children only puts them at risk for debilitating neurological reactions. If these are avoided, long-term immunity is often heavily impaired. THE MORE VACCINES AN INFANT RECEIVES, THE HIGHER THE MORTALITY RATE. How many babies have to die for doctors to get it? Synergistic toxicity is a well-known phenomenon where the combination of toxic substances can be greater than the sum of its parts. Therefore, mixing two non-lethal levels of chemicals inside a vaccine can lead to an extremely toxic mixture. The medical community appears to gloss over this very fact that appears to be progressively killing more and more infants every year. STUDY: NO HISTORICAL BENEFIT TO VACCINES. The evidence continues to mount. That vaccines are doing a great deal of harm is well beyond denying. The evidence that vaccines have had little or no effect on infectious diseases is clear, as documented in new graphs. The precautionary principle, which is enshrined in a UN directive, should have been implemented before vaccines were ever routinely injected. ALUMINUM IN VACCINES LINKED TO ALZHEIMER’S. When examining the cornucopia of toxic chemicals that saturate the environment in which all human life exists, aluminum has become the weapon of choice for the current population reduction program being facilitated by so-called immunizations. Aluminum, listed by the Environmental Pollution Agency as a developmental neurotoxin, is used as an adjuvant in vaccinations in order to enhance the effects of the already toxic concoction. GOVERNMENT DOCUMENTS: VACCINES & THEIR SCHEDULE A COMPLETE HOAX. A recent investigative report compiled by Dr. Lucija Tomljenovic, PhD, reveals more than 30 years of hidden government documents exposing these vaccine schedules as a complete hoax, not to mention the fraud of the vaccines themselves to provide any real protection against disease. “HERDING” VACCINE THEORY A COMPLETE HOAX & FAILURE. Get yourself and your children, if you still have any, out of harm’s way. Read the real research that reveals herd immunity doesn’t work. Never inject DNA fragments from other species into your blood. Check out the Freedom of Information Act and obtain the truth. Uncover the coverup. POLIO VACCINE PROGRAM ERADICATES CHILDREN, NOT POLIO. In the depths of cyberspace lurks a press release written by the CDC, confirming that the OPV, or oral polio vaccination, given to millions of children throughout the developing world, is causing them to develop vaccine-induced polio. Instead of banning the vaccination, as one would expect, the CDC has decided in its wisdom that the best way to tackle the problem is to maintain a high rate of vaccination in all countries! BEN SWANN: VACCINE COURT & AUTISM. What if I told you that while HHS says there is no link between autism and vaccinations, the federal government has quietly awarded families of autistic children damages as a result of vaccine injuries? The first step toward truth is to be informed. WHOOPING COUGH OUTBREAKS TRIGGERED BY VACCINATED CHILDREN. It is a common myth that unvaccinated children are the social scourge responsible for triggering outbreaks of rare diseases like pertussis (whooping cough), measles and shingles. But the scientific literature suggests otherwise, showing in many cases that vaccinated children are the ones responsible for triggering and spreading disease. ANOTHER VACCINE RESEARCHER CAUGHT FAKING RESEARCH; VACCINE INDUSTRY RIDDLED WITH SCIENTIFIC FRAUD. Yet another vaccine researcher has been caught faking research on a bogus AIDS vaccine, adding to the pattern of fraud and criminality that characterizes the vaccine industry. Dr. Dong-Pyou Han from Iowa State University just resigned after admitting he spiked rabbit blood samples with healthy human blood to falsely show the presence of antibodies that would “prove” his AIDS vaccine worked. VACCINATION VOODOO: WHAT YOU DON’T KNOW ABOUT VACCINES. Author Catherine J. Frompovich assembles a breadth of research and compiles the “must know” information regarding the false science about vaccination and the rise in correlated diseases. Regardless of your position on mass vaccination programs, this book will surely make you question their safety and effectiveness. THE DEADLY TRUTH ABOUT FLU VACCINES & PREGNANCY. Why does the CDC claim a flu vaccine during pregnancy is a safe and effective when even the H1N1 vaccine insert clearly states this is not true? DOCTORS’ FINANCIAL REWARDS FOR ADMINISTERING FLU SHOTS. What would readers think if I provided an admission in writing from a medical doctor as to a reason why the medical profession should consider administering flu vaccines? What would readers think if one of three reasons for doctors giving flu shots is “the financial health” of a medical practice? EUGENICS TODAY: HOW VACCINES ARE USED TO STERILIZE THE MASSES. The blueprint for sterilizing vaccines has been first conceptualized way back in the 1920s and 1930s by social scientists of the Rockefeller Foundation. Although later the eugenic language (“anti-fertility vaccine”) was polished up with the help of some linguistic plastic surgery producing the term “anti-fertility vaccine,” the ultimate goal remains the same. THE ANTIBODY DECEPTION. The underlying foundation of claims by the medical and pharmaceutical industries regarding vaccine effectiveness is clearly a shaky one. The evidence that vaccines work—without even taking into account the many studies which have demonstrated that they do not—is wholly unreliable even when demonstrating the “proof” claimed by the researchers. In short, neither vaccination nor antibody response equals immunity. RESEARCHERS DISCOVER SWINE FLU VACCINE CAUSES NARCOLEPSY. A team of Swedish clinicians have clinically linked a 2009 swine flu vaccine to increased risk of narcolepsy in young adults, and a group of Danish researchers now understand how and why. THE GREAT MEDICAL MYTH OF VACCINE SAFETY & EFFECTIVENESS. The medical establishment continues to credit the smallpox and polio vaccines for eliminating these diseases. Both vaccines were, in fact, abject failures. Sol Luckman is a prolific visual artist and critically acclaimed author. 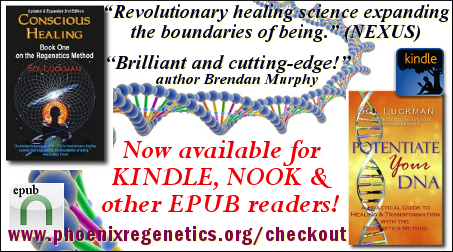 His books include the international bestselling CONSCIOUS HEALING and its popular sequel, POTENTIATE YOUR DNA. Sol is also author of the BEGINNER’S LUKE Series of seriocomic novels characterized by Reader Views as a “modern-day ALICE IN WONDERLAND” and by Apex Reviews as a “mind-bending journey through the mind of the ultimate iconoclast.” His latest novel, SNOOZE: A STORY OF AWAKENING, set for release in 2014, is the riveting, coming-of-age tale of one extraordinary boy’s awakening to the world-changing reality of his dreams. View Sol’s paintings, read his blog and learn more about his work at www.CrowRising.com.